Each country may enter in each weight category: - one (1) competitor. 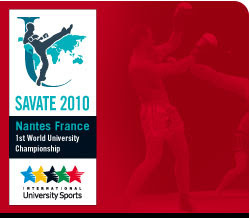 The countries participating in the Savate competition must participate in covering the costs of the international referees and judges F.I.S. (Art. 5.3.1). The total amount of the referees and judges cost will be divided according to the number of the participants and all countries participating in the French boxing competition will pay on ration of the number of their participants. The Organizing Committee will announce the exact sum after the deadline for the Quantitative Entry Forms three (3) months before the World University Championship. Each country is authorised to enter a maximum of seventeen (17) persons from which twelve (12) competitors (6 men and 6 women) and five (5) officials. The competitors must be born between January 1st, 1982 and December 31st, 1992.